This week on Talking 80s Music, we turned our spotlight on Utopia... no, not the place. 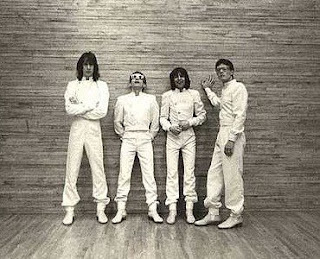 We featured the Todd Rundgren-led power-pop band in a retrospective mix as well as their singles "Crybaby" and "Feet Don't Fail Me Now." So many enjoyable and diverse songs to choose from but we believe you now know your Utopia from your Undertones. We were able to hold a giveaway this week for the Rick Springfield, John Waite, Lou Gramm and Eddie Money concert on Apr. 25th via the show and newsletter. The problem for many readers and listeners was that it was in Las Vegas and 7 days from now. We wound up holding our drawing for newsletter subscribers with Mark McNiece winning. Despite having only 20+ listeners in the chat room, we opened it up to Twitter and Facebook members and... Teri Mann won tickets. (Just beating out another listener.) So, all is right with the world and Teri (and guest) and Mark (and guest) will join Martin (and guest) at the concert.